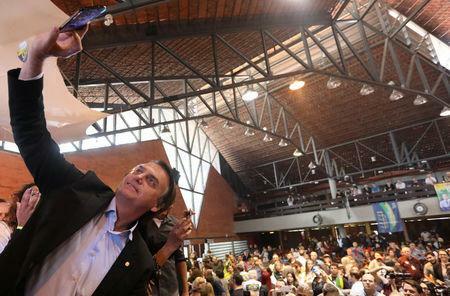 BRASILIA (Reuters) - Far-right candidate Jair Bolsonaro gained ground over his rivals in the first round of Brazil's presidential election set for Oct. 7, a new poll showed on Thursday, though it remains unclear who he will face in an expected run-off vote on Oct. 28. The Workers Party's candidate Fernando Haddad surged into second place with 16 percent of the voters surveyed backing him, a 3 percentage point rise, but he is statistically tied with Ciro Gomes, a center-left populist. Gomes' support remained at 13 percent, according to Datafolha. The poll indicated that Lula's strategy of convincing his supporters to vote for Haddad, a former mayor of Sao Paulo, is working well and his stand-in could well reach the second-round vote. Two-term president Lula was banned from running due to a corruption conviction but he remains Brazil's most influential politician and his party is could return to power after governing Brazil from 2003 to 2016. Among the other candidates in the first-round vote, Geraldo Alckmin, a favorite of the country's business class and a former governor of Sao Paulo, stayed at 9 percent and environmentalist Marina Silva sunk to 7 percent, less than half the support she had the outset of the campaign last month. The most divisive election since the end of Brazil's military rule three decades ago has become increasingly polarized between right and left, raising concerns about the future of the country's democracy. Bolsonaro, an admirer of Brazil's 1964 to 1985 military regime, has accused the Workers Party of trying to rig the elections. His running mate retired General Hamilton Mourão has said the armed forces should carry out a coup if the country's judiciary cannot end political corruption.